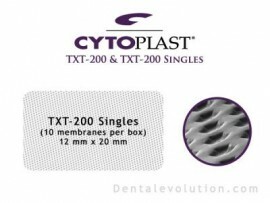 Often praised for their predictability, Cytoplast® TXT-200 and TXT-200 Singles are manufactured from high-density PTFE, which is engineered to withstand exposure. This key feature, coupled with the Cytoplast® Technique for grafting extraction sites, offers the ultimate in both predictability and esthetics. For this reason, the TXT-200 Singles are our most popular membranes for socket grafting. By avoiding releasing incisions and displacement of keratinized tissue often associated with obtaining primary closure in socket grafting, clinicians preserve soft tissue architecture and keratinized tissue. The textured Regentex™ surface increases the surface area available for cellular attachment, thereby assisting in stabilization of the membrane and prevention of soft tissue retraction. The exposed membrane can be removed non-surgically after at least 21 days using tissue forceps and a topical anesthetic; a surgical removal is not necessary if the membrane is left exposed. Both TXT-200 membrane sizes can be trimmed if necessary.